In two recent columns for Civil War Times, historian Gary Gallagher repeats many arguments he has made in the past dismissing scholarly work on the Civil War West – a theater that he defines in his August 2017 column as extending from the Appalachians to the Pacific coast, and from North Carolina to Georgia. In other words, Everywhere but Virginia. Many of these arguments are misleading and some are just plain wrong. Let me explain why. Events in the West were widely reported across the nation, and those Americans who lived in the West, aspired to live in the West, or had loved ones who lived in the West, cared very much about the war there. News items about developments in the Southwest appeared in newspapers across the nation. Unlike news from the eastern theater, there was a time lag between events and reportage: the lack of telegraph wires beyond the 100th meridian and the disruptions of railroad travel caused by wartime events meant that easterners typically heard about engagements in the West long after they were over. This does not mean they were not considered newsworthy. The New York Times, for example, ran a lengthy letter reporting on “Affairs in New Mexico” in the same issue (October 20, 1862) as the oft-referenced and quoted review of Mathew Brady’s exhibit of Antietam photographs. Abraham Lincoln addressed military events, Indian Affairs, and exploitation of mineral resources in the West in his presidential addresses, and Congress acted in several different ways (see below) to bring the West more firmly into the Union as a vast free territory. 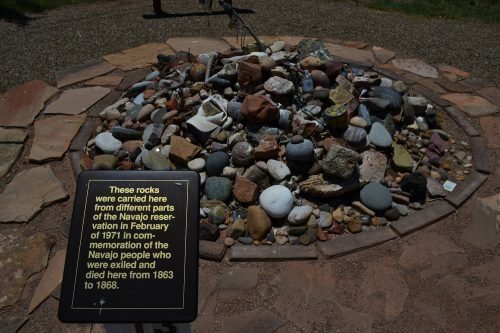 Spontaneous Memorial to Navajos Imprisoned at Bosque Redondo (1864-1868), Fort Sumner Historic Site, New Mexico (1971-present). Gallagher’s assertion that no one cared about the West also privileges the eastern viewpoint (as most Civil War histories do) and erases the fact that hundreds of thousands of people living in the West cared very much about wartime events there. Native Americans and Hispaños served in the Union Army in the West, and the war was a pivotal moment in their communities’ histories. Easterners are not the only Americans whose opinions and wartime experiences mattered. Soldiers who served in the West saw their wartime actions as important and connected to Union and Confederate war efforts farther east. For soldiers, especially the rank and file, it was a sense of duty to the Union or the Confederacy that drove them to enlist for service in the Southwest – the same feeling that inspired their eastern theater comrades. Colorado gold miner Alonzo Ickis, for example, explained to his brother in 1861 that he had mustered into the Union Army in Cañon City, a small mining town in the Rockies. “I hope you will not think I have done wrong,” he wrote, “for I do think it is the duty of every single man to enlist and do all in his power to end this war.” Ickis believed that the Sibley Brigade’s invasion of New Mexico threatened the Union, and that he and his comrades were responsible for defending the region in the name of the nation. Union Soldiers’ Monument, Santa Fe Plaza (1868). These are just two of thousands of enlisted men who served in the Union and Confederate armies in the Southwest and who were proud of their service during the Civil War. The Confederates were especially angry that their efforts were not remembered in the same way as those of their eastern comrades. After all, they had done something no other Confederate army had managed to do: in March 1862, they accepted the surrender of and occupied a Union capital city (Santa Fe). While the campaigns in the West were short-lived, they did indeed have consequences in the eastern theater. Most importantly, they lost access to Pacific ports and to many supply routes through Mexico, which made them even more vulnerable to Union blockades. From that point on in the war, the Confederacy would have to rely on its own forms of production and its own citizens to fund the war effort (rather than gold drawn from western mines). This would have several consequences for the Confederate military effort later in the war, as the government initiated tax-in-kind and southerners became increasingly restive in the face of privation. True, there were fewer soldiers involved in these campaigns than in the East. But if you want to talk numbers, let’s talk numbers. In the East – which for my purposes here includes Virginia, North Carolina, South Carolina, Georgia, Tennessee, and Mississippi – Union soldiers gained/retained 84.9 acres of territory per soldier over four years of marching, fighting, and occupation. 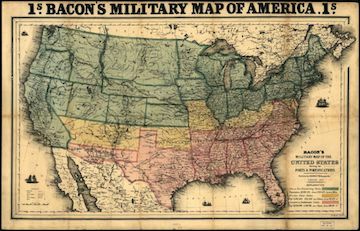 In the West, Union soldiers gained/retained 83,853 acres per soldier over one year of marching, fighting, and occupation – if we only count NM, AZ, and CA as “the West.” If we count the land mass west of the 100th meridian, they gained/retained 254,033 acres per soldier. These are pretty significant numbers, in terms of both scale and time frame. They indicate that Union soldiers in the West accomplished one of the major goals of warfare — territorial acquisition – far out of proportion to their smaller numbers. The War was a significant political and social turning point in the West. In his August column in Civil War Times, Gallagher does acknowledge that the Republican Party had an agenda for the West, exemplified in a series of Civil War legislative acts such as the Homestead Act and the Pacific Railway Act. However, Gallagher thinks Congress would have achieved these without the war. But Republicans in Congress had not been able to pass any of these acts before the war, while southerners still held their seats. They were only able to pass them after the South seceded and their representatives had resigned. Republicans then took advantage of their super-majorities to pass these acts to promote the conquest and colonization of the West, which they had been advocating since the late 1840s. Additionally, Republicans did not pass these acts and Lincoln did not sign them until they had received news of the Sibley’s Brigade’s forced retreat from New Mexico in May and June 1862. Civil War mobilization also brought many more American soldiers into New Mexico and Arizona than had been garrisoned in forts there before. These soldiers re-opened the Butterfield mail route, reestablishing communications between the East and West overland. They built roads and protected mining operations throughout New Mexico and Arizona. All of this work established the infrastructure that made Congress’ legislative acts and conquest of the West possible in later years. 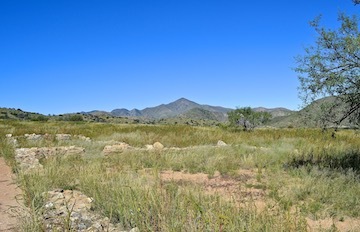 The stage station at Apache Pass, site of several clashes between Chiricahua Apaches and Union troops on their way to the Rio Grande from Los Angeles in the summer of 1862. These Union soldiers also initiated long-term military campaigns against Navajos and Apaches, aiming to eradicate or remove them in order to bring the West more securely into the Union. The Union Army’s conflicts with Native Americans were Civil War actions. These conflicts, which were ongoing during the Union and Confederate battle for the Southwest and then accelerated between 1863 and 1865, were fought by regiments that had been mustered into Civil War service. The goals of these campaigns – territorial expansion and security – supported the Union cause and shaped Union nationalism. These battles were recorded, reported, and memorialized as part of each regiment’s Civil War service. 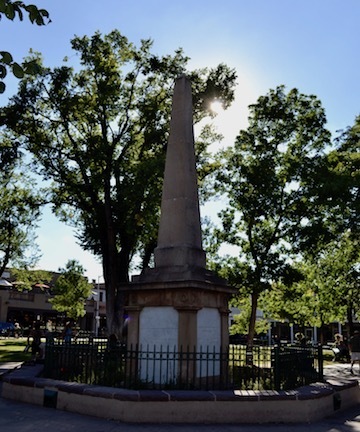 For example, the Civil War memorial that Santa Fe residents erected in the middle of the plaza in Santa Fe, honors “the heroes of the federal army” who fell in battles with the “rebels” at Valverde, Glorieta Pass, Apache Canyon, and Peralta; and those who fell in battles with “savage Indians” in the Territory of New Mexico. These may have been separate campaigns in the sense that the Union soldiers’ adversaries were different, but soldiers and civilians in New Mexico saw them as part of the same war effort. 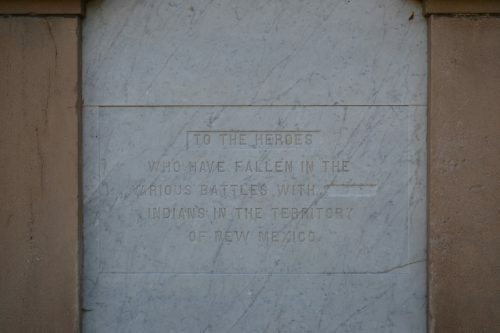 Inscription on one of four faces of the Union Soldiers’ Monument, Santa Fe Plaza (1868). Americans fought the Civil War on multiple fronts, and all of these theaters mattered to the outcome of the war. I hope that students and scholars of Civil War history will agree that our work does best when it illuminates all aspects of the war, whenever and wherever it was fought. This doesn’t mean that we should not think seriously about and critique one another’s research and writing. It speaks well of us as scholars, however, when we value new fields of study for the ideas they produce rather than dismissing them because they do not focus on the same place, or use the same sources, as those studies that have come before. The excellent research and writing that scholars of the Civil War West have published thus far – and will publish in the future – enriches our understanding of the past. Isn’t this, after all, the goal of scholarly endeavor? A condensed version of this post will be published as a Letter to the Editor in the December issue of “Civil War Times“. excellent piece and a great telling of why western campaigns mattered. Not to mention that the gold discoveries contributed mightily to the Union economy. In his book, An Aristocracy of Color, Michael Bottoms also argues that California was the source for a Reconstruction ideology because the state had dealt with a variety of racial issues before the war. It’s too bad that Bottoms’ book has not received more recognition and analysis. This is great. Can’t wait for your book. Love everything about this! Would love to chat with you sometime. I wrote an undergrad paper for my Civil War course about the Battle of Valverde! Definitely reported by NYT at the time and a big deal.